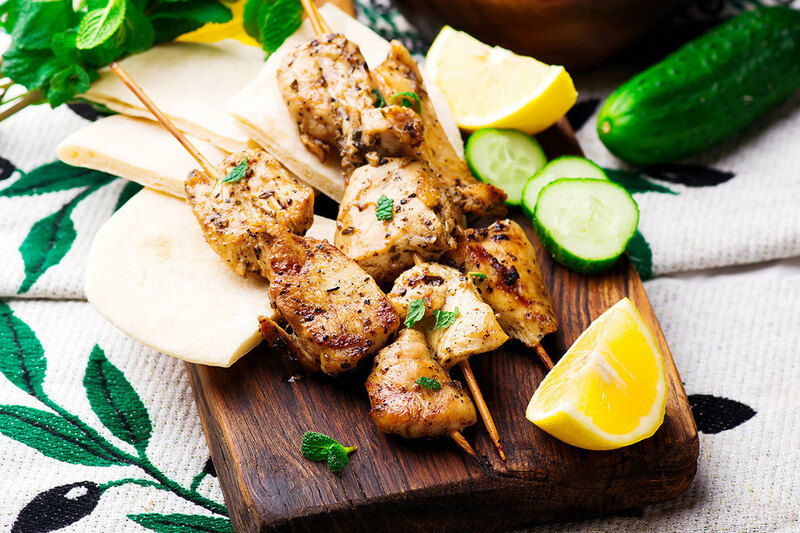 In the oven or on the grill, chicken souvlaki tastes delicious when loaded up in a pita with all of your favorite toppings! Combine chicken pieces, garlic, olive oil, oregano, salt, black pepper and lemon juice in a large bag or mixing bowl, and toss until the chicken is evenly coated. Seal/cover and refrigerate for 30 minutes or up to 1 day. Remove chicken from bag/bowl, and discard the leftover marinade. Thread chicken onto skewers. To cook chicken on the grill: Preheat grill to medium-high. Place skewers on the grill and cook for 6-8 minutes, turning once, until the chicken is cooked through. Transfer skewers to a separate plate, and set aside. To cook chicken in the oven: Preheat broiler, and place the rack about 5-6 inches from the top of the oven. Place skewers on a large baking sheet, and broil for 6-8 minutes, turning once, until the chicken is cooked through. Transfer skewers to a separate plate, and set aside. To assemble the chicken souvlaki pitas, lay a piece of pita bread out on a flat surface, tip it with chicken, your desired toppings and tzatziki sauce. Serve immediately.